Apple has temporarily taken its online Store down. Visitors to it currently see a "Be Right Back" notice and an explanation that the company is working on it. "We're adding updates to the Apple Store," it says. "Check back soon." While Apple always does this before a hardware announcement, this time it's different because we're one week away from the company's next big launch event. Previously these events have always included new hardware but persistent rumors have predicted that this March 25 one will be devoted exclusively to the updated Apple News service and the new Apple streaming video one. This week-early closure of the store would seem to back that up. It's not known what new hardware may be unveiled when the Store reopens but it's expected that we'll see new iPads. We may also see the long-awaited launch of the AirPower charging pad and conceivably even iMacs. The latest rumors about a new 2019 iPad suggest that it will come with a larger 10.2-inch display and faster processor, but otherwise retain the previous entry-level model's physical design. That means it's expected to keep using Touch ID instead of the newer Face ID, and also that it will still have a headphone socket. There are also strong rumors that Apple will revamp the iPad mini. This has not been updated since 2015, but according to analyst Ming-Chi Kuo, a new model is likely to at least be upgraded with a faster processor. on the uk site there's --yes!--an 11" iPad Pro, and very nice too. 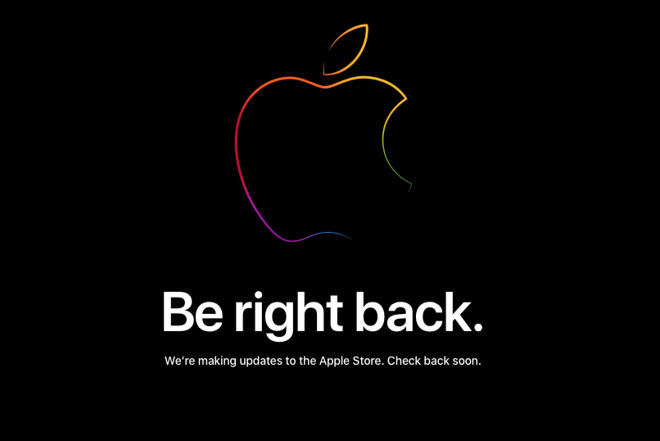 Looks like they’re doing something with iPads and iPhones (though the latter, I don’t know why as they are still new) because on the Apple website, when you click to buy an iPad or iPhone, you get that same “Be Right Back” message. However, you don’t get that message when you click to buy a Mac, Watch or Apple TV. And the same for iMacs..
Dang, I was hoping for an update to the Apple Remote, not the iMac. and it scrolls to the right as you scroll down. On the US site, I don't see any new New tags, just the same old New ones. No BRB, it must have been an gone. Nothing new jumped out at me. No new tags yet, but the store is still down. Read your post, clicked Buy and got the same thing as you. Been wondering how Apple is to going to position a 6 to 8 core iMac with Vega GPU against the iMac Pro with 8 to 18 core Xeon with Vega GPU. A cheap iPad LTE will be a great purchase too. Hoping for a new iPad Mini Pro model - pricing from $800-$1,500! No budget Mini! November 2018. The generation prior to the 11 was 10.5. Not a chance. (I hope I'm wrong.) But if I get a WiFi iPad Pro, a budget LTE mini would be fine. Oh - thanks, well to save face, I genuinely have been out of the loop - last time I was around two Russian guys seemed to do everything ... the new iPad mini is georgeous anyway. So any guess when the iMac will get an update? I know from other articles you report there’s little/no noise on an update but it seems overdue. Also, as an aside, I can’t remember the last time Apple’s lines seem so confused. Some consumer laptops with Touch ID others not; touchbar but not on desktop keyboards; pencil 1 & 2; Touch ID and Face ID. I'm looking forward to the next iMac, due to be released in 2022, as the Mac Mini team was a little peeved at the iMac team, so Apple decided to make things fair, and have a 4 year update between iMacs, and added an extra year as payback to the Mini team. They were at first stunned, then elated. On this iMac, it will be the only one to feature the Apple Pencil 6, which will have no compatibility with Apple Pencils 1-5, and have a tip that is threaded reverse, so even those aren't compatible. You'll be able to log in with your signature, but it'll be kept in the Giga-Secure data storage, along with your face for FaceID, all 10 of your fingertips for TouchID, your DNA for dnaID, your weight/BMI for WeightID and bmiID, your last 12 songs listened to for MusicID, and a sample of your DNA for dnaID. With SignatureID, there have been fears of a hack of this chip would let someone totally impersonate you, especially with the new cell 3D printers just released in 2021. As new Apple President, Tim Apple (a remarkable Tim Cook look-alike) said, in his 2011 keynote voice, "that'll never happen." Sorry about that... I got a little over excited about the idea of a new iMac (see above).